Elephants are an indispensable part of Hindu temples in Kerala. 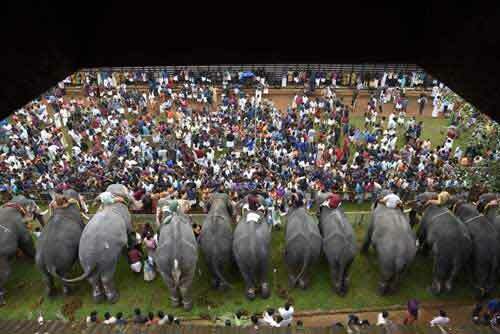 Anayootu or Aana Oottu is an important ritual in which mass feeding of elephants take place. ‘Aana’ in Malayalam means elephant and ‘oottu’ means to feed. In this mass feast, specially made rice preparations in the temples are given to the elephants. The most famous Anayootu is the one held on the first day of the Ramayana Masam in the famous Vadakkumnadan temple in Kerala. Captive elephants from the region participate in this unique event which attracts thousands of people. The Vadakkumnadan temple is world famous for the Thrissur Pooram. In the Vadakkumnadan temple, Ashtadravya Mahaganapathi homam – a puja dedicated to Lord Ganesha – is held before feeding the elephants. The Anayootu begins when the main priest feeds an elephant with the ‘prasad’ from the homam. A Gaja pooja is also held during Anayootu. The annual aanayoottu festival at Vadakkunathan Temple in Kerala is observed on the first day of Karkidakam month (July 16 or July 17) as per traditional Malayalam calendar in Kerala. The ritual begin in 1982. In the festival, each elephant is given 5 kg of cooked rice, turmeric power, ghee and other herbal medicines. As per the ritual, the youngest elephant among the herd is fed first.